I am producing and hosting a brand new radio show on the Dash Radio Network. 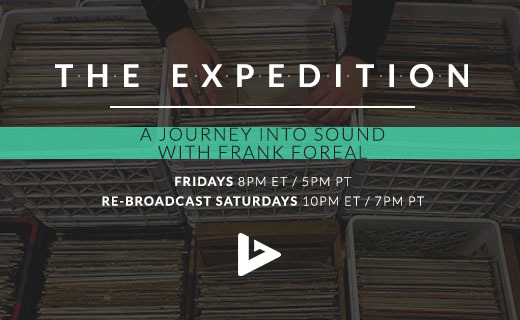 “The Expedition – A Journey Into Sound with Frank Foreal” is all about uncovering music,new and old, from all over the world. New bands, producers, DJ’s, as well as vintage finds. I’m very excited to be producing this show alongside fellow music junkies, Derrick Ah Sam and Michelle Choug, who I’ve spent many hours (and years) with talking about music that we love. The Expedition airs every Friday at 5pm PT /8pm ET, with a re-broadcast every Saturday at 7pm PT / 10pm ET. You can listen to our recent archives via our new Mixcloud page, and make plans to tune in this week. We could also use your support via all social media networks: find us on Facebook/Instagram/Twitter @EXPEDITIONRADIO. If you enjoy what you hear, please like and share! That being said, this is a bittersweet moment, as I will be stepping away from my duties on Soundwaves Radio, a great program that I have had the honor to work on the past 20 months. Without Sean Osborn‘s generosity, bringing me on the airwaves with him, Val The Vandle, and Francesca Harding, I could not have earned the confidence and experience to lead me to this point. I am so grateful to you all!